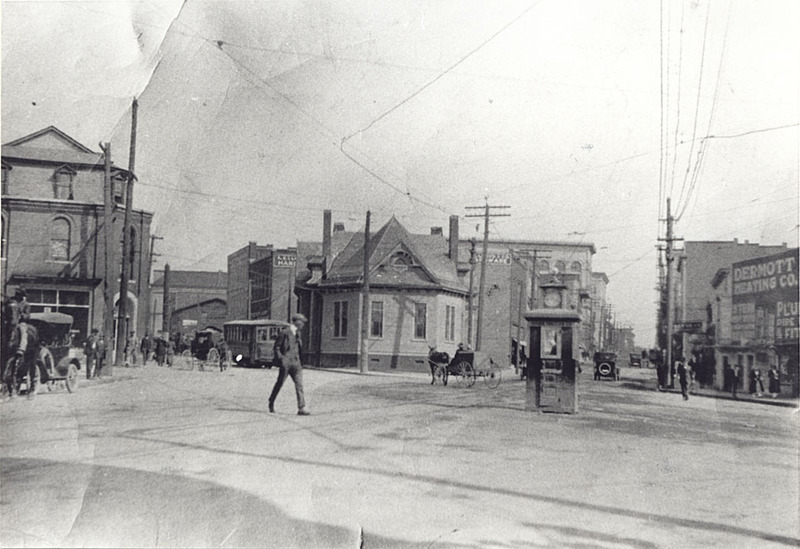 Looking west on West Main St., 1905. 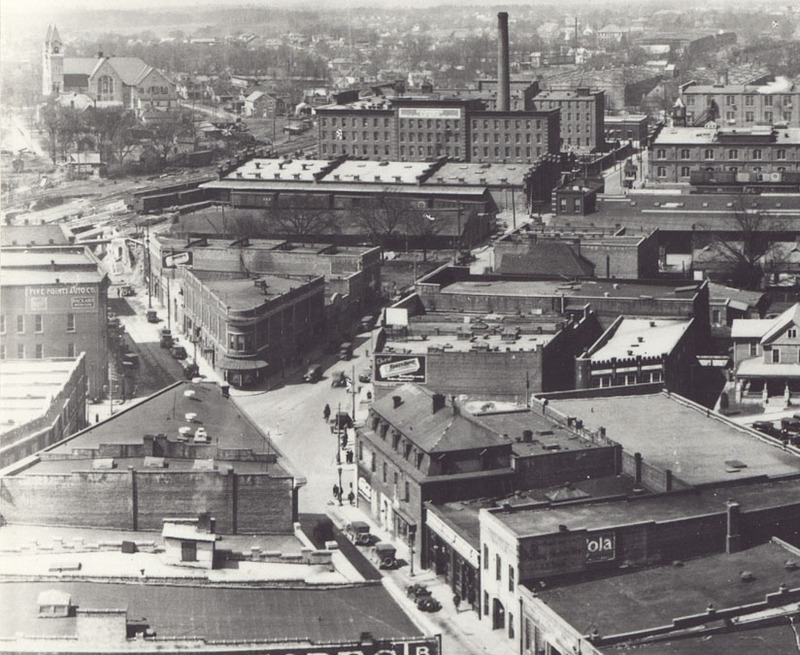 New mercantile, masonry structures replaced the earlier industry structures during the 1900's, 1910s, and 1920s. 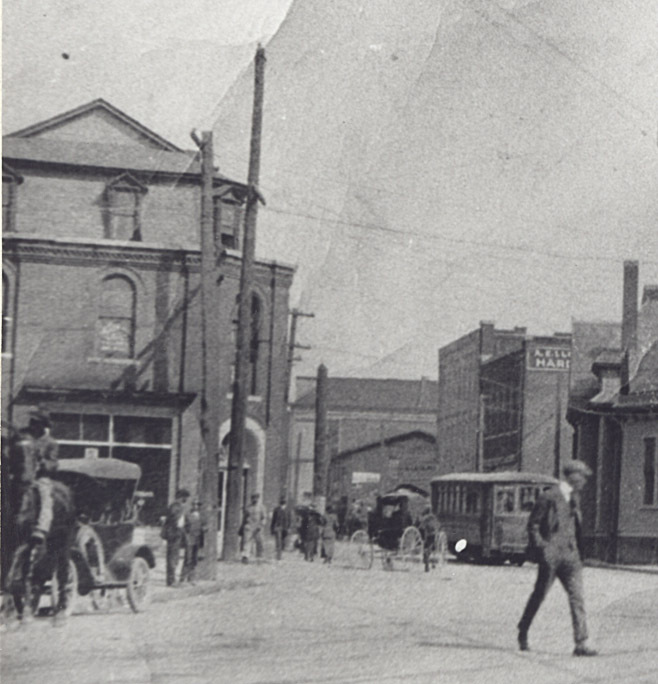 The Five Points Drug Company, occupying was one of those impressive new structures - a flatiron building located on the western 'point' of Five Points, constructed in 1907. 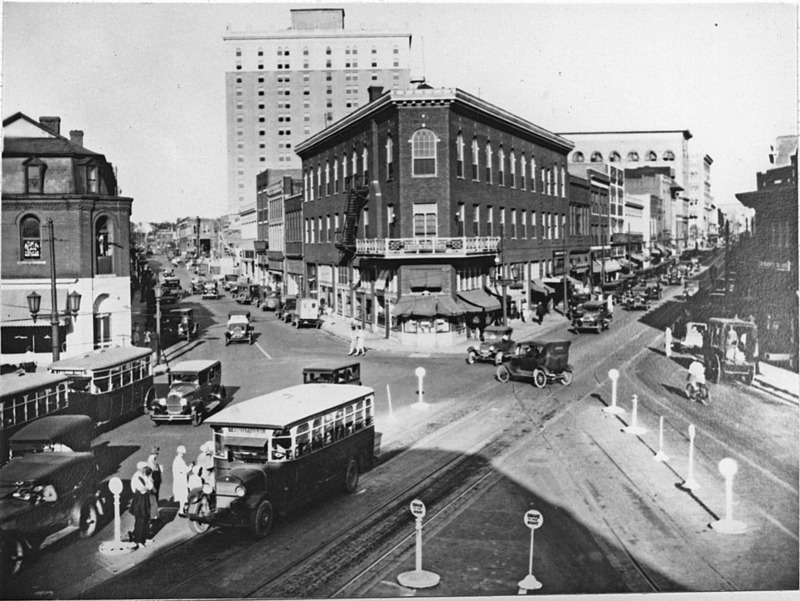 Five Points Drug Co., looking northwest, 1920s. 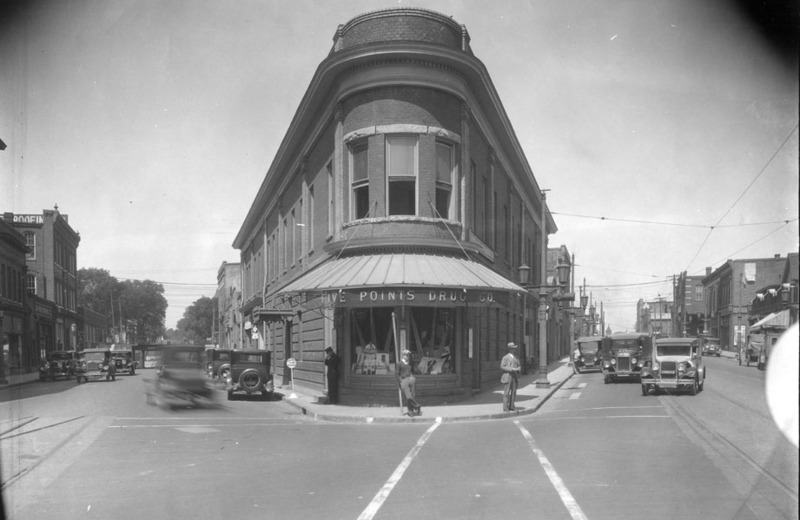 The Five Points Drug company occupied the beautiful flatiron building in the top picture until the late 1920s, at which point the building burned. 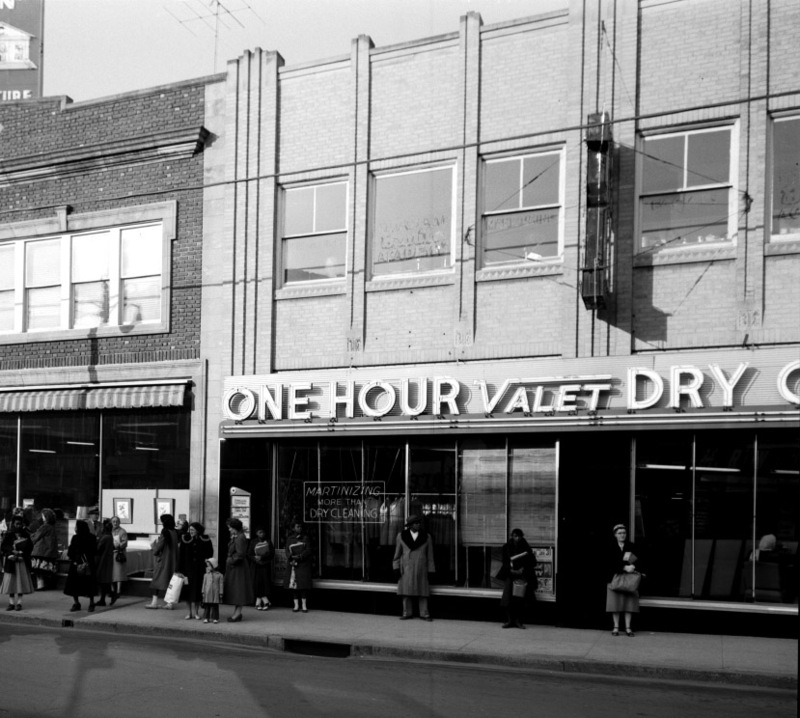 The garage at 421 West Main Street, immediately it its west, remodeled itself to face the 'point' once the Five Points Drug Company was gone, utilizing the vacant space for gas pumps and parking. 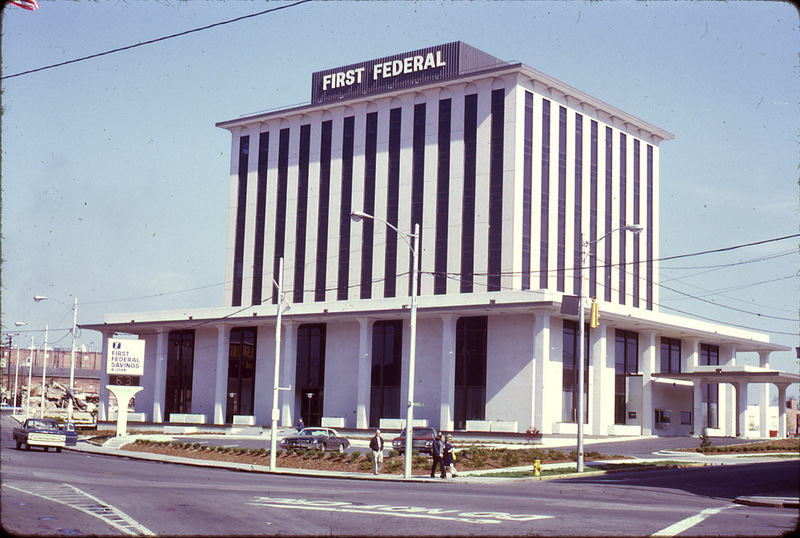 By the late 1950s, the First Federal Savings and Loan Company had taken over the gas station, and utilized the 'point' simply for parking. Whether this stirred a desire for some beautification from the S&L or from the city, there followed construction of a wee garden and fountain at the tip of the point. Ahhhh - what asphalt? 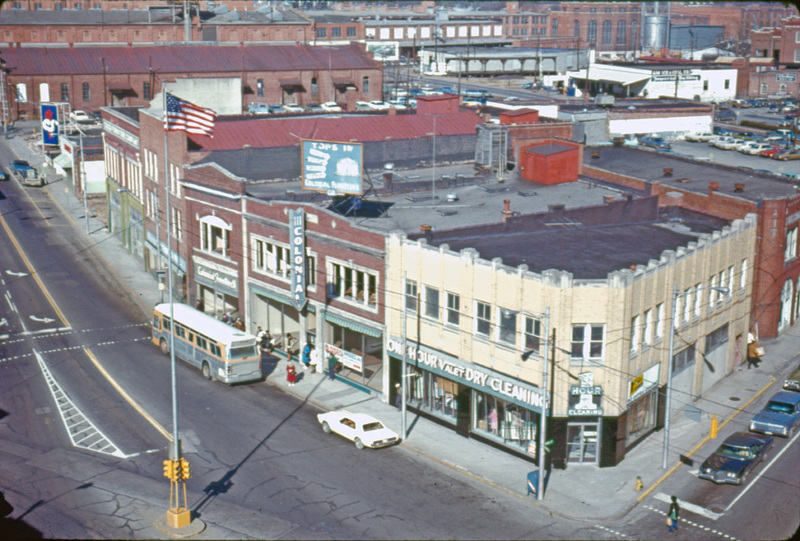 With construction of the Five Points Restaurant in the 1970s, the vacant lot became a courtyard. 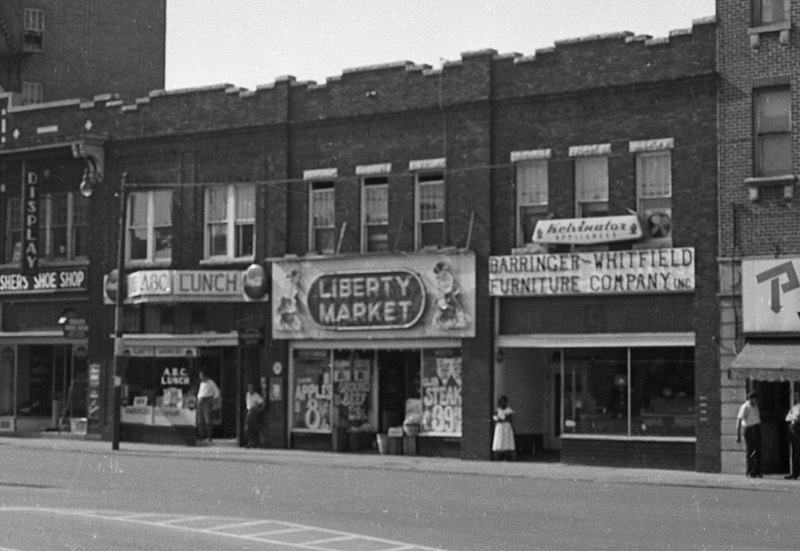 These buildings also burned during the 1970s and were later demolished. The Vacant Triangle became even larger, and for the last ~30 years has been grass and trees. Our latest efforts to deflect the vacancy of the land include a nice streetscape construction, to include benches, trees, brick, and - if he had had historic bollards, historically appropriate bollards. 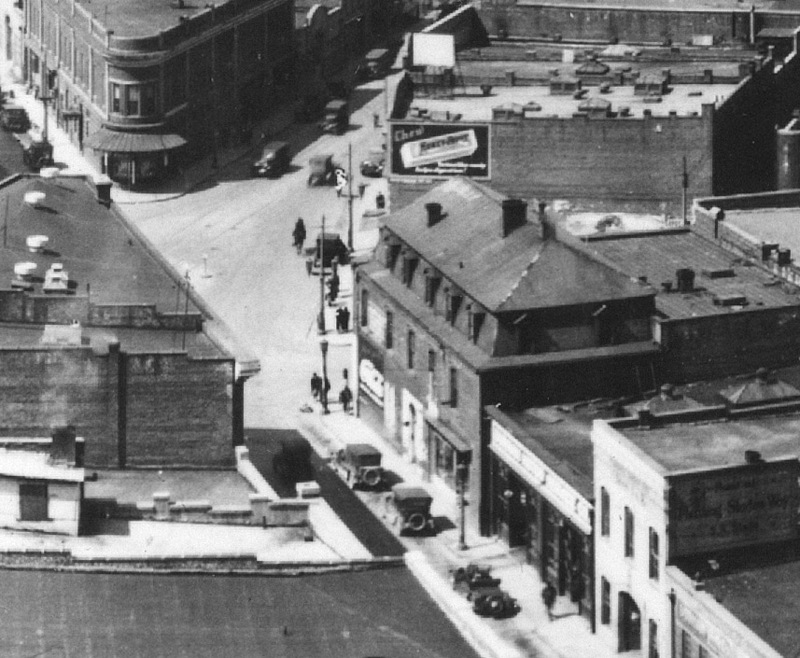 Two buildings still exist in the triangle of land left between the 'point' and the Loop. Unfortunately, the vacant land, the Loop, and the stark dominance of the Southbank building leave the area feeling more desolate than it should. The sidewalk is pretty, but what this spot really needs are buildings, ideally a new flatiron building. The longtime owner, Anna Ho Whalen, has not publicly expressed any desire to make that happen through action. I can't say that I'll ever understand the vacant land/vacant building investment-without-planned-development model; personally I'd be embarrassed if I ever considered sitting on a vacant piece of land in the center of downtown for 30 years. 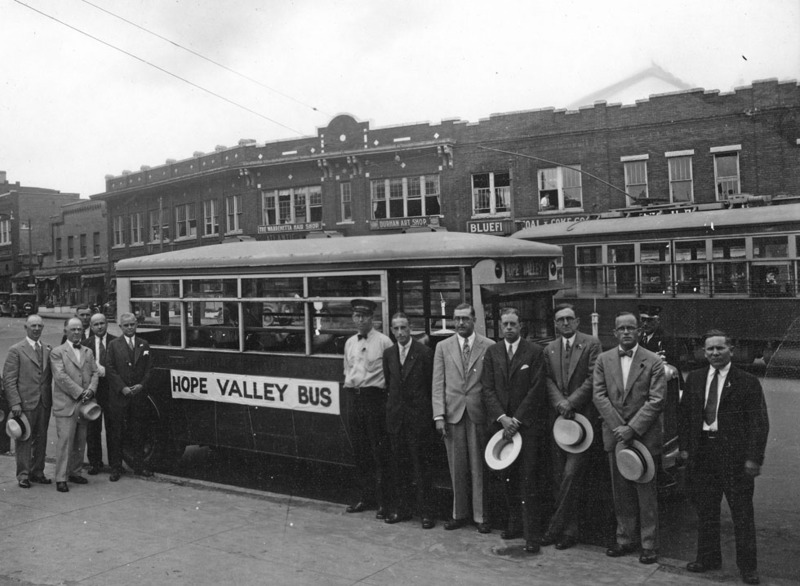 In my view, Five Points remains the most important intersection in Durham as a focal point for future revitalization. The city has undertaken a (prolonged) effort to fix the transportation problems with the intersection (returning it to a true 5 points configuration and returning the traffic on Chapel Hill St. and Main to two-way.) While I am a big fan of the transportation improvements, the land use at Five Points remains a challenge. Update: Summer 2007: The two-way transformation of Main and Chapel Hill Sts. is complete, and an absolute triumph. But, some nice benches and copious bollards aside, the flatiron spot is still vacant. Five Points - western point, looking west, 09.12.10, with me about to be run down. 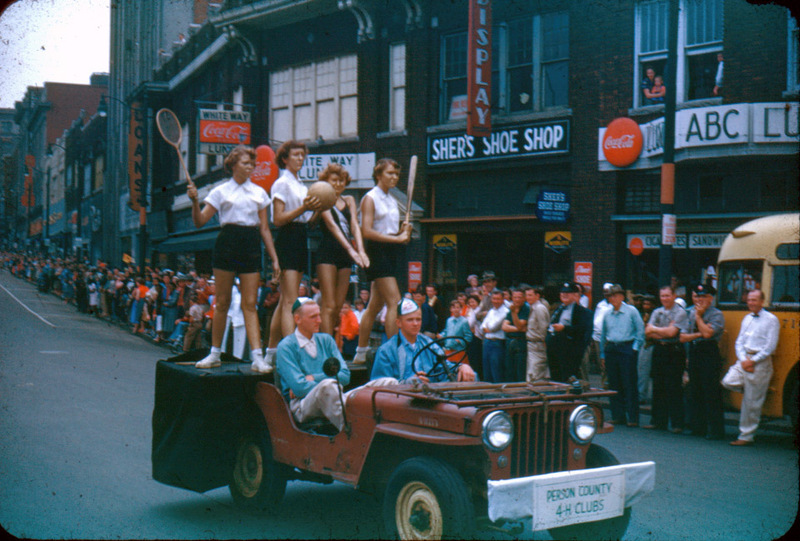 1939 Duke Homecoming Parade (Retrochrome.net) showing 400 W. Main as the "Advance Store" and "Durham Beauty Academy." I was a bit loath to believe that this shot was from as early as 1939, but I can't imagine the "Advance Store" would use a rising sun logo after the early 1940s. Though much modified, this building is one of the oldest remaining in downtown - minus its original, quirky Second Empire roof. Note the unusual 3rd floor, which almost appears to be a type of hipped roof with projecting dormers - including a dormer facing the cut corner. Also notice the arched doorway, matching the windows. 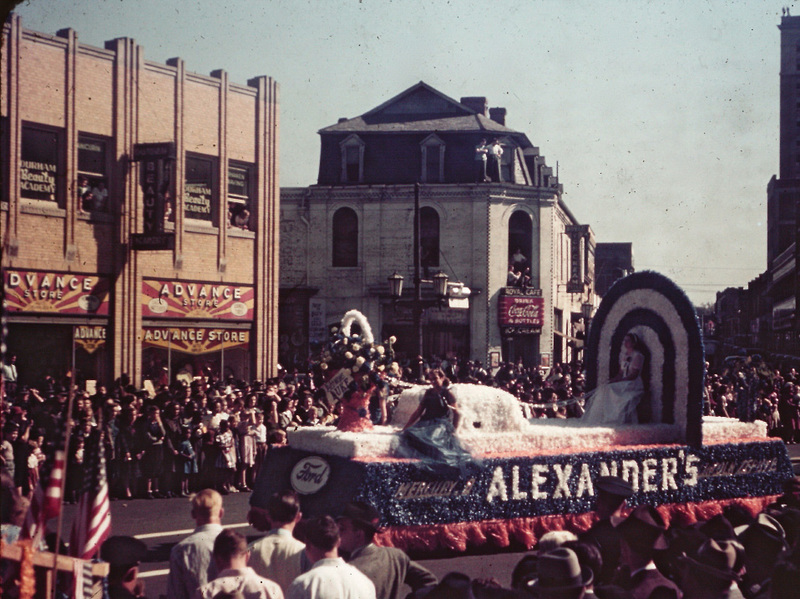 A view of the building during the Tobacco Jubilee parade, 09.25.47. This impressive shot is noted as being from 1939, but I'm not certain of that. 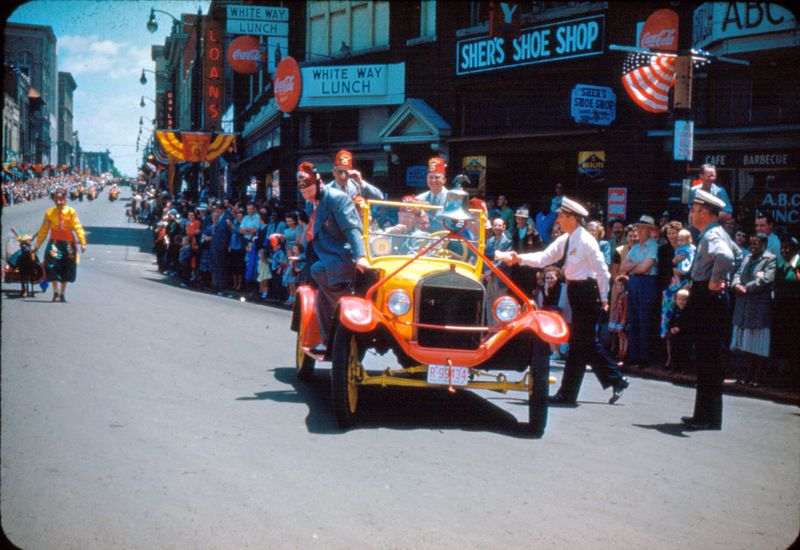 I'm no expert on vehicles, but what I can see makes me think of 1940s rather than 1939 - but regardless, a very early color shot. 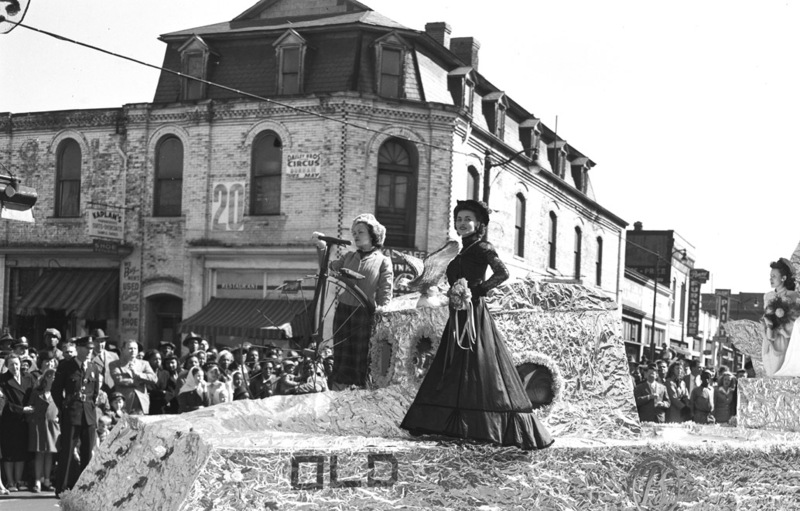 It appears that the building was radically altered in 1954. A pox on people's desire to 'modernize' perfectly wonderful buildings. 1954 view - again, only a partial view, but you can see the scaffolding around the building. 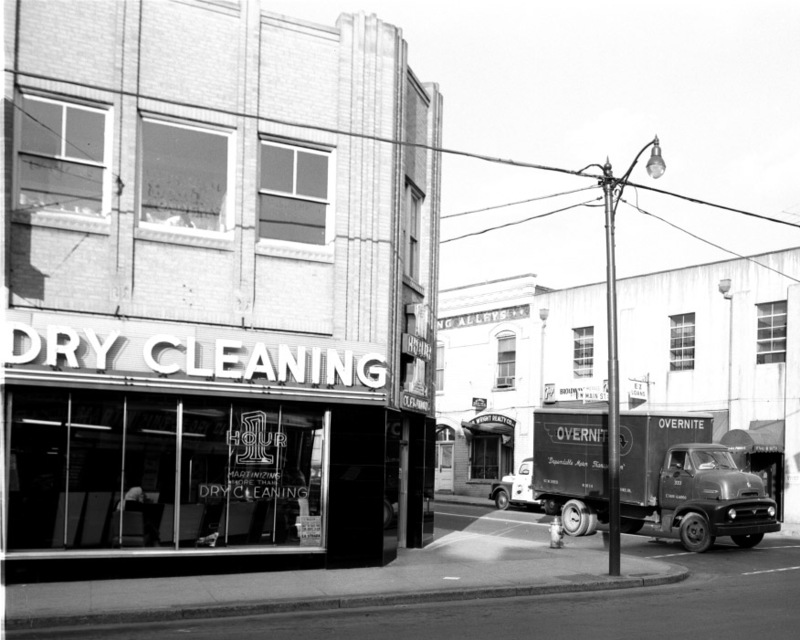 A 1950s view of the altered building. The top floor has been removed, and all of the windows squared/replaced. 1960s - I spliced two historic photos together to make this picture - so it's a bit funky, including half a car by the front door. Through no fault of its own, this building is prominent in the remarkable and ugly scene below, 1964. More abuse arrived by 1973, in the form of a false facade, but that stubborn arched door remained. Make those ugly windows go away! They frighten me! The city renovated this building - I believe in the 1980s, but I'm not positive about that, and it has had a series of tenants over the years. Here is the building as of 2006. All in all, not bad, given what it had been put through. 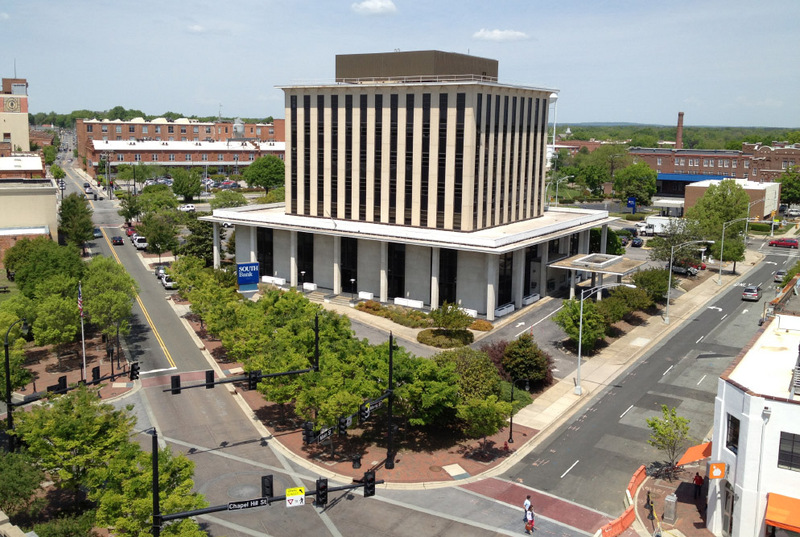 It is an important building at Five Points, as it gives at least one corner some definition. While I am not certain that it is as old as 1893, it certainly dates from pre-1910, and is the only extant building near Five Points that was contemporaneous with the first public library. Scott Harmon purchased the building from the city of Durham in December of 2011 and began renovations soon thereafter to convert the building into retail and residential condominiums. The building (re)opened in summer of 2013, with retail tenants such as Pizzeria Toro and the Cupcake Bar. 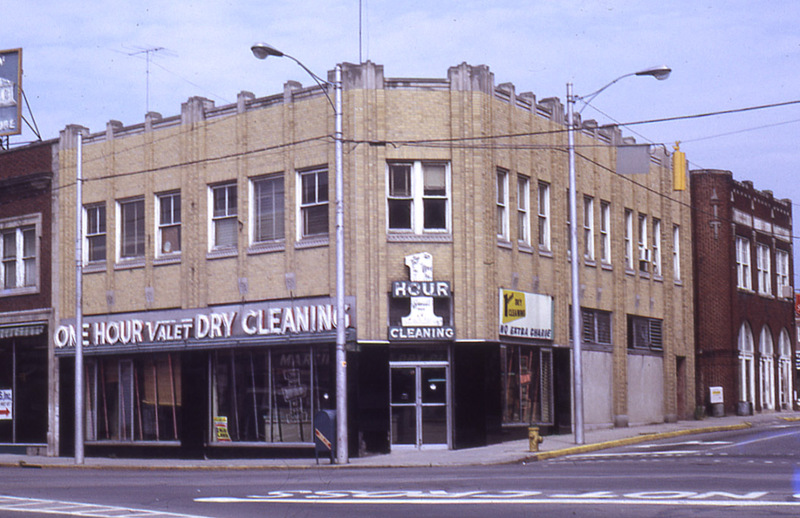 One of Durham's two great flatiron buildings at Five Points, both now gone. 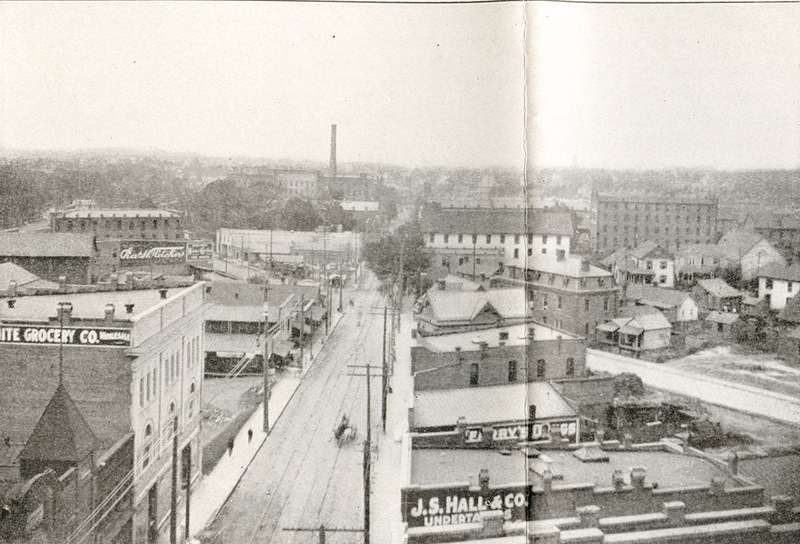 Looking northwest (towards Five Points) from West Main St. 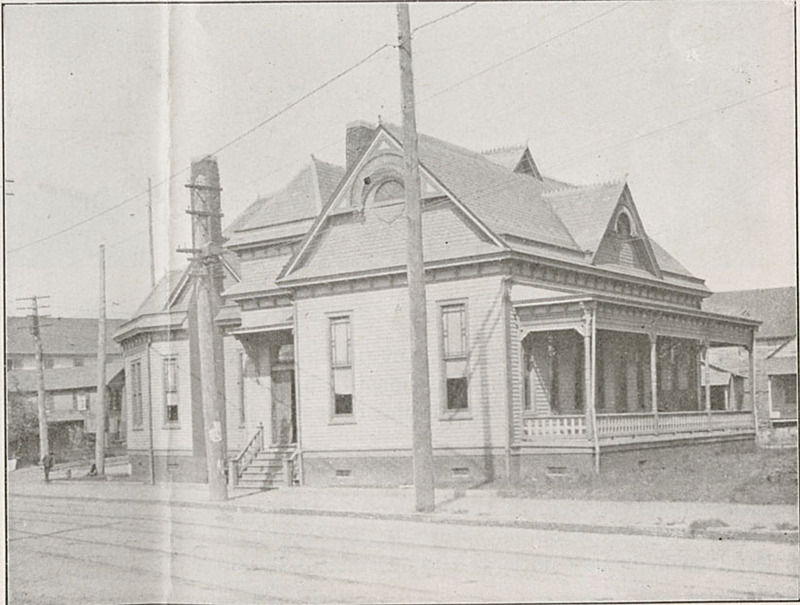 The main public library was established in 1897 as the first public, non-subscription library in North Carolina. The "Canterbury Club" - a women's social group - began fundraising and enlisting support from other groups to build a library for Durham. Ms. Lalla Ruth Carr donated the land at the eastern point of Five Points, said to be worth 00, as a location for the library, which opened in 1898. 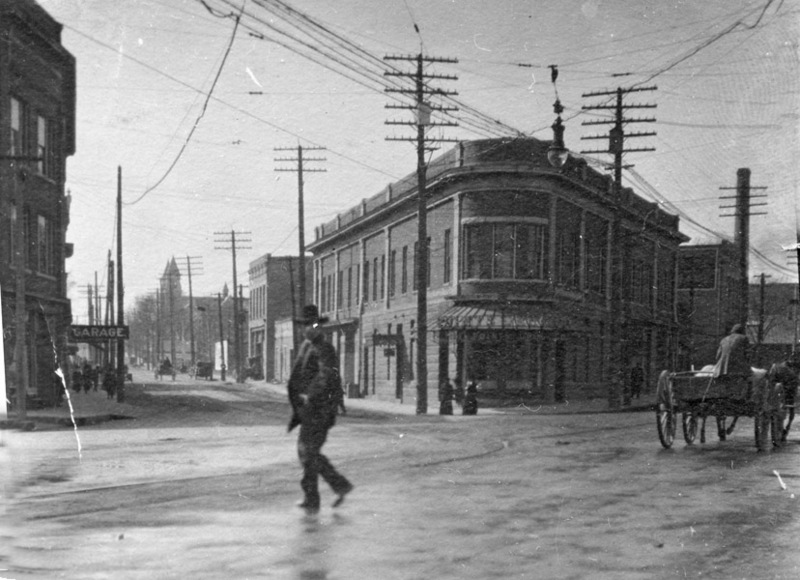 When the library moved to its building on East Main Street in 1921 (still standing! 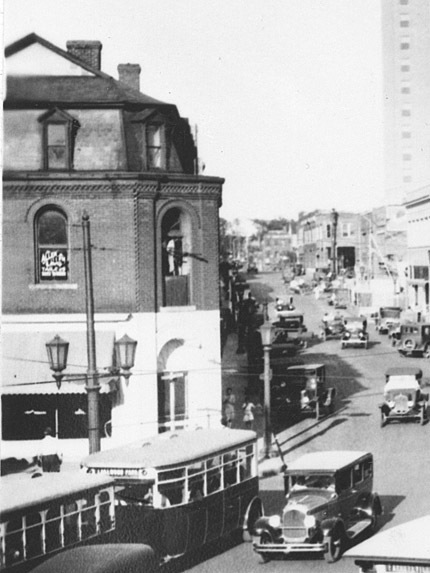 ), the wood frame structure was torn down and replaced with a flatiron building, called the Piedmont Building that same year. This building had a flat face, unlike the rounded front on the opposite point. (Which you can see the shadow of in this, evidently, late afternoon picture.) 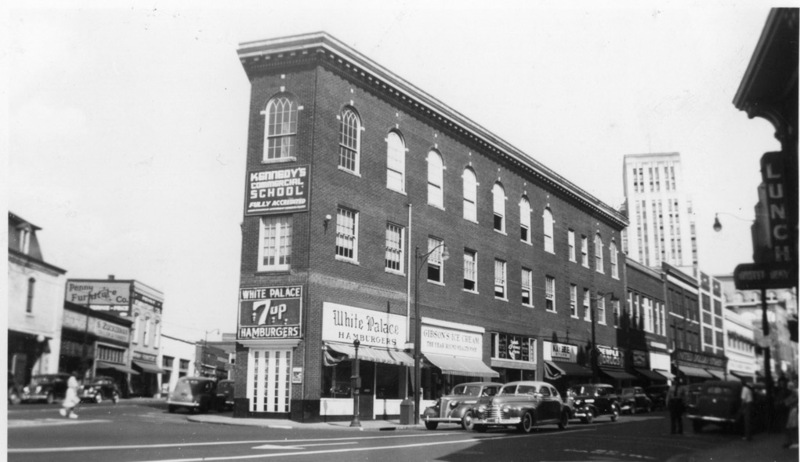 The building was built by the Piedmont Club, a newly organized 'men's club' that intended to build a structure that would provide facilities for their club (as well as retail space on the first floor - much like the Temple Buildng and Masonic Temple building further east on Main St. The building contained a ballroom and kitchen area on the third (top) floor. Judge Sykes was the president of the Piedmont Club, Foy Robertson the vice-president and JM Markham was secretary-treasurer. Unfortunately, in November of 1965, this building burned. Looking west from the Washington Duke Hotel, November 13, 1965. 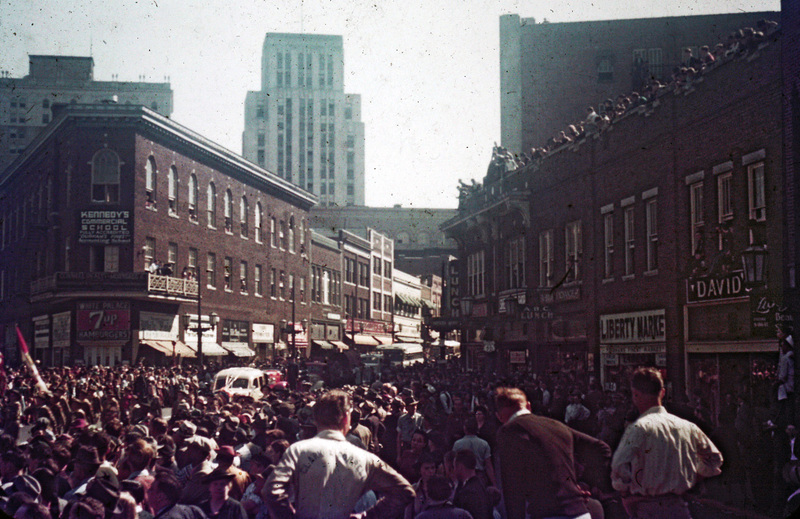 Looking west-southwest from East Chapel Hill St., November 13, 1965. This 1966 shot shows the building - which frankly looks salvageable in this photo - after the fire. 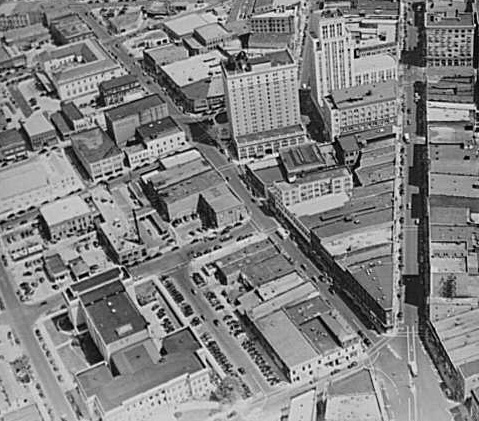 It appears that the city may have planned to demolish it through urban renewal anyway, as it was appraised in 1964 by the urban renewal folks - before the fire. 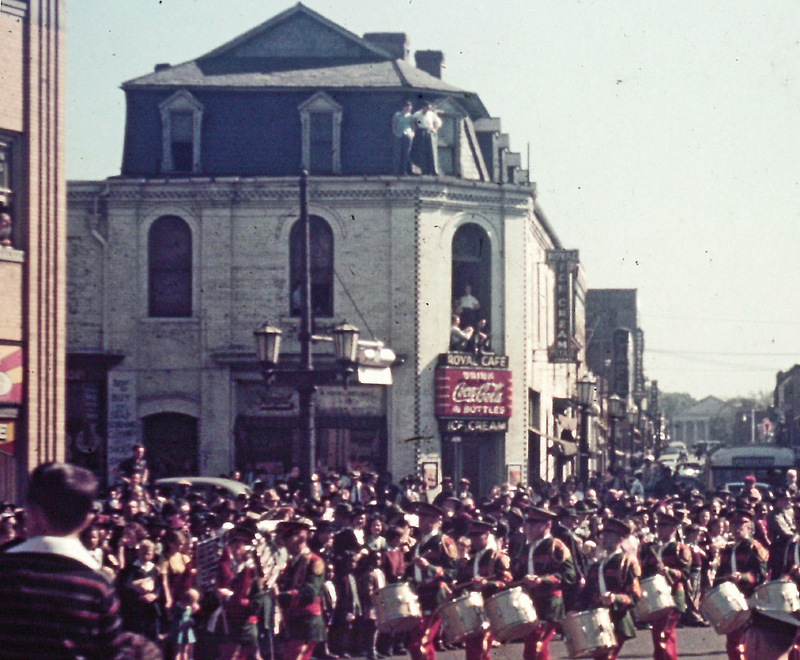 In September, 1966, the building was torn down. This may have been one of a handful of times that this plaza hosted this many people. "I can't understand, we built such a lovely plaza in place of the building - why doesn't anyone use it?" "That's better. Look how relaxed these young men are." With the demolition of Durham Drug and Belk-Leggett, the 'plaza' has a large parking lot behind it. We're currently in the midst of remaking it as public space. Multiple buildings behind (to the east) of this building have been demolished as well, which is why this very, very important space seems so empty. It is truly unfortunate that the city is rebuilding a 'plaza' at this point. The last thing downtown Durham needs is more open space. This space desperately needs buildings to give the necessary definition to make it feel like city instead of emptiness. That's what happens when you have economic development people doing urban design. This plaza will likely be as empty as the 1970s "Muirhead Plaza" version it replaced.